There is a total of 13 rooms from single to triple rooms with private bathroom in the main building. Guests can enjoy a bar, jacuzzi (capacity 7 people), sauna for 5 people and a fitness room, located in the basement. Accommodation in cabins: 10 cabins are with 4 beds, TV, a fridge, a kettle, a telephone and each room has its own terrace. Sanitary facilities in each cabin. Two cabins are with seven beds, TV,a fridge, a stove, a telephone and a common terrace for both rooms and shared facilities. One is a two-floor cabin with seven to 14 beds with shared bathroom facilities on both floors. There is available an outdoor pool available, a volleyball court, bowling, table tennis, billiards. If you order we can provide massages and horse riding and transportation to the lifts, to the public transport and tours. At approximately 1500 m is a large ski resort Polom - Severka with ski school and ski equipment rental. Babyhouse is an apartment house focused on families with children. The apartment house is located in Dolní Lomná village, which forms a part of the Beskydy Protected Landscape Area. The valley stretches between the ridges of Kozubová, Skalka and Velký Polom, with a crystal clear Lomná creek flowing through. This area is an excellent starting point for hiking trails. Fans of both, summer and winter sports can “have a ball”. Not far from the apartment house there are several downhill slopes and cross-country trails (Severka, Přelač, Ski Area Kempaland, Ski Area Mosty u Jablunkova, Polanka). 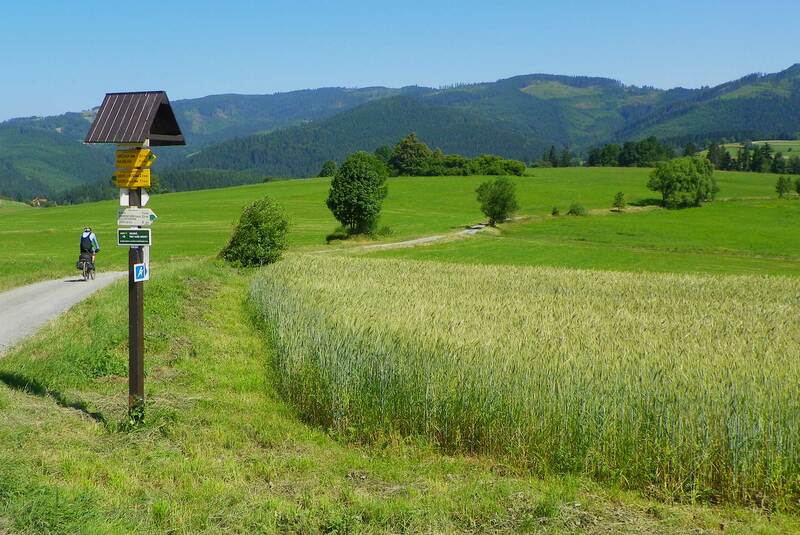 Throughout the year you can enjoy biking or in-line skating on a new cycling path, or visit the Mionší virgin forest known for its rare vegetation and animal species. There is also a possibility to take a ride by horse and cart (need to be arranged in advance). Dolní Lomná 251. Bed and Breakfast Helena is located in a quiet area of Dolni Lomná with beautiful views of the surrounding countryside. Accommodation is offered in three four-bed apartments and one triple apartment. Each apartment consists of bedroom with TV, kitchen for self cooking with all the necessary equipment and restrooms. Entry to the building is barrier-free. One apartment for disabled people. There is a private car park on the right by the Bed and Breakfast. price: 250 CZK per person/night. Possibility of further discount - for groups and longer stays. Details:a restaurant, a fireplace, skiing 3 km. A tourist cottage is reopened on the ridge of the Beskydy mountains between Kozubova and Slavíč. Tourist accommodation is offered for 12 people in the newly refurbished rooms. In the ground floor there is a cozy restaurant with local specialties. Cottage is situated on the main access route to the ridge and is 2 km from the bus stop "Dolni Lomna, Doubrava , about 40 minutes of walking. Cyclists can come to the chalet along the marked cycling path no.6082. Access by car (or bicycle) is a forest road leading from the bus stop "Dolni Lomná, Matuščina louka 'or Košařiska the" bus stop Košařiska, Vodarna" from blue tourist sign turning. A pleasant atmosphere of our chalet will pleasantly surprise you as well as a newly renovated rooms that offer comfort and feel as if you lived at home. Rooms are equipped with high-quality TV (LCD), DVD and a possibility of WI-FI connection. Each room has its own bathroom. Kamenna chalet has a spacious cellar on the ground floor intended for storing of bicycles, skis, prams or other equipment that you want to enjoy on your holiday and you would like to have it locked up. Parking is available on land that belongs to the chalet and is for free. And we did not forget the small ones. In the ground floor of the chalet there is a playroom with lots of toys and children can watch here their favorite fairy tales. There is a trampoline, swings, sandbox and jungle gym on front of the chalet for children. We would also like to welcome you in our restaurant. You can find specialties and delicious home made food in our menu. Our hotel guests can borrow petanque, badminton, bicycles and board games..
Matice Slezská offers accommodation in the premises of the ethnographic site in 2, 3, 4 and 5 bed attic rooms. They are heated by heaters and have a shared bathroom facilities, a kitchenette with a refrigerator and a gas stove, TV in rooms. Boarding is possible in the near Manes restaurant (seasonal) and year-round in the hotel Pod Akáty. Address: Dolní Lomná 71. Sanitary facilities in rooms, in some TV - satellite and DVD, internet, table tennis, parking by the hotel for 20 cars is ready for guests . In the next building is a solarium, massage. Hotel is located in the center of Dolni Lomná mountain village, in the immediate vicinity of the famous Matice Slezska area, where are folklore and folk festivals regularly held. The hotel has a restaurant with a capacity of 45 seats, non-smoking dining room, lounge for 30 people and outdoor seating in summer. Festive lunches and dinners, wedding receptions, anniversary celebrations, balls and cultural events are held in the hall with a capacity of 80 seats. One of the advantages is also easy access for wheelchairs and lift - one room is barrier -free room. Roubenka "Pod Pralesem" is a detached house by a mountain stream Lomňanka, with beautiful views of the mountains, close to primeval forest Mionší and ski resort Armada. Ideal for year-round recreation even with children. The house consists of two separate apartments. Apartments are comfortably furnished, with a living room with a kitchen and a fireplace, two bedrooms (7 beds), a satellite television and the Czech TV. Accommodation in 2-6 bedded rooms with no facilities. A restaurant is available for guests and visitors (during the summer terrace with a service), indoor and outdoor swimming pool, sauna. In the immediate vicinity of the chalet there is a ski resort with four lifts, ski school and ski equipment rental. Suitable conditions for hiking, cycling, nature schools, convalesce, ski courses, ... reception in operation from 9:00 to 21:00. Pension Rzehaczek is located in Dolní Lomná, a beautiful place in Silesian Beskids. It offers accommodation in two-storey stave building with attic and six apartments. The overall capacity of pension is 28 beds.